It has been a horrendous week in Dhaka, the capital of Bangladesh and the world's most dense urban area (104,000 population per square mile/40,000 per square kilometer). On Tuesday, a five story residential building collapsed, killing 23 people in the building and in other structures in the path of the collapse. Then, on Thursday evening, a fire started on the lower floors of an 8-story residential building in the old town section of Dhaka. By the time it was controlled, 117 people had died and 8 buildings had been destroyed (link to Daily Star photo). Disastrous fires are an unfortunate fact of life in the hyper-dense informal settlements (shantytowns) that pervade large urban areas in developing countries. 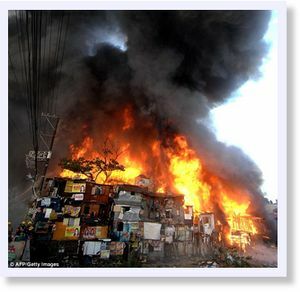 In April, 7,000 people were left homeless in a Manila shantytown fire (photo), while the homes of 4,000 families were destroyed in another Manila fire just three weeks later. While Dhaka has no shortage of shantytowns, this was not a shantytown fire. The bigger risk is the sprawl of high rise buildings (5 stories to 20 or more), which are home to most of the people who do not live in shantytowns. The Daily Star now reports in an article entitled, "Filled-up, Full of Risk" that much of the land is "reclaimed" and "marshy" in Dhaka and not suitable for multi-story buildings. Recent heavy rains have made the situation worse, and at least three additional buildings have begun to tilt since Tuesday's collapse. 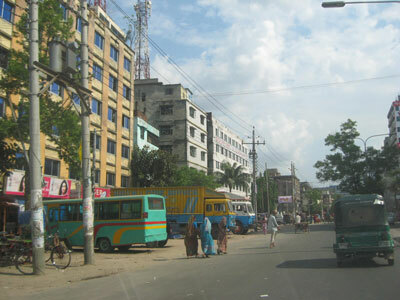 Dhaka is built on one of the most challenging sites for an urban area. It sits on one of the world's largest river deltas (the Ganges-Brahmaputra). The combined river course (called the Padma) is only miles to the west. Only 200 years ago, the Brahmaputra itself ran to the east of Dhaka and then changed course. This illustrates the instability of the riverine system, which completely surrounds the urban area with tributaries and river channels. A map produced in the Daily Star, illustrates the problem. The red areas are considered safe for building multi-story buildings. Virtually all of these areas are now developed. However, large sections of high rise buildings have been developed outside the red areas (see photo), especially between Mirpur and Gulshan. Virtually all of the areas that can be developed are unsuitable for high rises. With a population expected to rise from the current 10 million to 16 million by 2025, Dhaka needs room to grow. It will not be easy. Submitted by infoverflow on Mon, 05/04/2015 - 00:40. That was a sad news.Hoping that all of them can recover and be able to stand gain..Thank you for the post.It's been a great story.. Submitted by zac1 on Mon, 04/27/2015 - 01:42. Submitted by arceeboyDladiesman on Sun, 04/26/2015 - 22:46. Submitted by xahgzr1122 on Thu, 04/09/2015 - 09:46. Submitted by xijozx1122 on Wed, 04/08/2015 - 05:29. Submitted by xahgzr1122 on Sat, 04/04/2015 - 05:03. Submitted by xijozx1122 on Mon, 03/30/2015 - 05:28. Submitted by xijozx1122 on Tue, 03/17/2015 - 09:28. Submitted by xijozx1122 on Mon, 03/16/2015 - 05:04.